In this postcard, internee Eugenio Roiz writes to Sauro's wife Clementina about the outcomes of his hearing. Under the DOCR (Defence of Canada Regulations), after 30 days, internees could formally object to their detention to an advisory committee appointed by the Minister of Justice. The Minister of Justice then appointed a judge to review the internee’s case. This meant an examination of the RCMP’s evidence against the internee, meetings with the internee, and interviews with witnesses who could attest to the internee’s character. After this, the judge either recommended an internee’s release or continued internment to the Minister of Justice. Here, Roiz mentions that the evidence supplied against him seems to come primarily from community informants. Their motivations varied. Here he names two of the more notorious -- Camillo Vetere, a former school teacher and journalist, and Reverend Augusto Bersani. 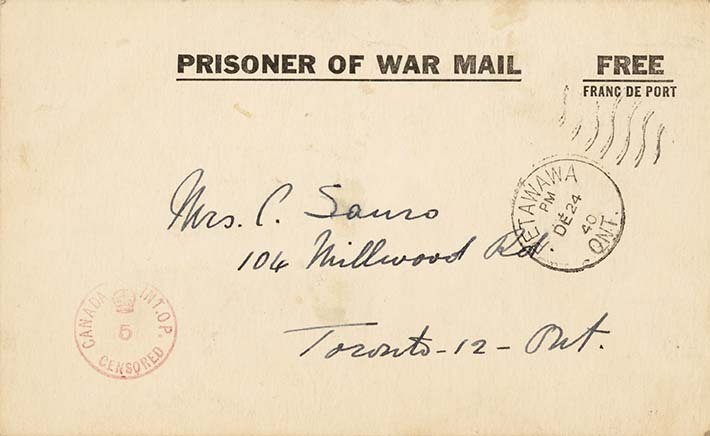 Recto: [t-b, l-r]: [printed on paper] PRISONER OF WAR MAIL FREE / FRANC DE PORT [circular stamp] PETAWAWA / PM / DE 24 / 40 / ONT. / [wavy lines] [handwritten in ink] Mrs. C. Sauro / 104 Millwood Rd. [circular stamp] CANADA [crown] INT.O.P. / 5 / CENSORED [handwritten in ink] Toronto – 12 – Ont.